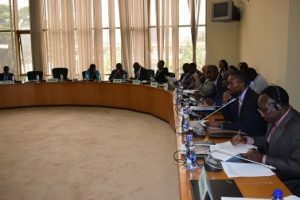 14-09-2017, Addis Ababa (Ethiopia): Representatives from the United Nations High Commissioner for Refugees (UNHCR) and the Intergovernmental Authority on Development (IGAD) briefed the African Union Permanent Representatives Committee on the Comprehensive Refugee Response Framework (CRRF) for Refugees in Africa and its application in the IGAD Region. The consultative meeting was held at the AU Headquarters in Addis Ababa on 14 September 2017. On September 19, 2016 the United Nations General Assembly (UNGA) adopted a set of commitments to enhance the protection of refugees and migrants. The New York Declaration sets out the key elements of a Comprehensive Refugee Response Framework (CRRF) to be applied to large-scale movements of refugees and protracted refugee situations through easing pressures on refugee host communities, enhancing refugee self-reliance and expanding third-country solutions. One other important element of the CRRF, also highlighted during the presentation at the AU Headquarters, was the creation of conducive environments in countries of origin for voluntary and sustainable returns. The IGAD region was hailed for championing the application of durable solutions in Africa as seen at the Special Summit of IGAD Heads of State and Government on durable solutions for Somali Refugees and reintegration of returnees in Somalia held in Nairobi on 25 March 2017. The region has gone on to develop a Regional Framework for durable solutions which will guide efforts aimed at dealing with some of the most protracted refugee situations on the continent. The PRC further commended countries in the IGAD region for the concrete commitments made making reference to the Nairobi Declaration and its accompanying Plan of Action. Other African regions were urged to take experiences from the IGAD region and work together to address the refugee situations in Africa.